Along with all the information that Rebecca and I would like to share with you we would like to show you that restrictive diets do not mean that food can no longer be enjoyable or that treats like muffins will no longer be part of your life. With this said we will each be sharing recipes with you all twice a week that are kid tested and kid approved. These recipes will be primarily be free of most common allergens like wheat, dairy and soy. Over the last 2 years, as mentioned in my last post, I too have been on a health journey along with the Monkey. With my passion for cooking and my new found love for foods that can heal the body I have been putting together my recipes to hopefully have a kid friendly allergy cook book in the near future. This will be one of the recipes I will be including. This week we are starting off with these yummy little morsels. The Monkey loved these so much that he literally stole a few and ate them in hiding when I wasn’t looking. 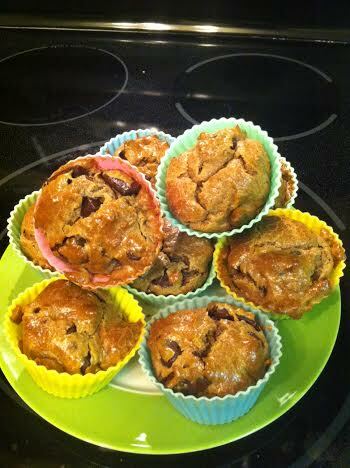 These little muffins are dairy, grain, nut, and sugar free if you do not use chocolate chips. I will also be trying to make an egg free version of these over the weekend and if they work I will update this post letting you all know. So why do I use sunflower seed butter? Not only is sunflower seed butter like this one which is made simply from sunflower seeds tasty but it also has a decent nutritional profile. Two mini or 1 large muffin will supply you with 4 grams of protein, 6% of your daily iron, 3% of your daily calcium needs and this is in just the sunflower seed butter alone. Add in the vitamins you’re getting from the bananas and apple sauce, the protein and omega 3 from the flax seeds and these muffins are very healthy. Also because I am cooking these primarily for the Monkey I try to gear things towards being school friendly. Seeds are fine to bring to school where as nuts are not due to allergies so when he starts school in the fall these will make the perfect addition to his lunch box. Here are the regular sized muffins made by Rebecca and Meredith. They used simply apple sauce to make theirs and they turned out wonderfully. I completely forgot to take pictures of the mini ones which I made because they disappeared too quickly. 1/3 – 1/2 cup raisins, cranberries or chocolate chips. Place all ingredients except the raisins, cranberries or chocolate chips like Enjoy Life, in a *blender and blend together till smooth. Pour batter into a mixing bowl and stir in the raisins, cranberries or chocolate chips. Divide into a greased muffin tin. This recipe will make either 24 mini muffins or 12 large muffins. Bake mini muffins for 12 min and the large muffins for 20. Allow them to cool in the pan so they firm up. Note:The following day after Rebecca made her batch of muffins she noticed that the insides had turned a lovely shade of green. This is completely natural and is caused by the chlorophyll in the sunflower butter which reacts to the baking soda. This in no way alters the taste of the muffins and for some reason the mini ones did not do this. To counter act this you can decrease the baking soda to 1/2 tsp and increase the apple cider vinegar to 1/2 tbsp. This still may not fully eliminate the green colour which occurs. We are completely used so eating green baked good when using sunflower seed butter now but the first time I ever used it the Monkey and I had to have a long talk about where the green colour comes from and how plants use chlorophyll etc… for him to be even willing to continue eating them. They would be perfect in this green state for Halloween or even St Patty’s day though and you could always call them Green Monster Muffins if it makes them more appealing. I hope you will give these a try regardless. They do taste very good and I am sure you will love them. I am sure that nut butters would work in this recipe as well however I have never tried it. If you do make this with nut butter I would love to hear how they turn out. *I have a vitamix so blending the ingredients was very easy in my blender however when Rebecca tested this recipe for me she found that the batter was too thick for her’s. She said that she used her Kitchen aide Stand mixer with great success. Also if using pumpkin or butternut squash you will want to add 1/4 cup of honey or maple syrup to the mix as neither are sweet enough to exclude this.